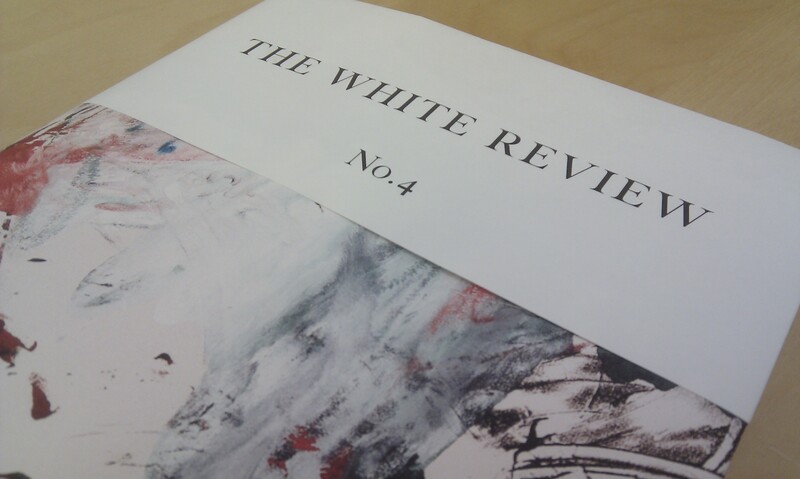 My copy of The White Review (No.4) arrived today. This literary and arts quarterly is a handsome and hefty 17 x 24cm softcover, wrapped in a thick paper poster which has been cunningly folded to present the title, barcode etc alongside Jackson Pollock-like abstract artwork by Landon Metz. And then the whole thing is shrink-wrapped. Inside, the contents pages are inserted loose and in a smaller format. There’s also a pull-out poster by Gabrielle Beveridge. The marbled paper is bespoke, and let me also mention the typesetting – in ‘Joyous (Blanche)’ – which is precise, elegant and authoritative. The whole thing is quite sumptuous, and harks back to the golden age of the literary review. As a physical object, The White Review is finely engineered nostalgia. In the best possible way. I am enjoying the sensation of holding it. I am wondering where the money comes from to make such a thing. We must not allow ourselves the indulgence of timidity, we must shake off any listlessness, and we must refuse to be austere. Instead we must make, write, argue, dream, paint and act in the faith that creativity is commensurate with progress, and that we are responsible for our own futures. The future is there to be forged. If you are interested in poetry, you should buy this issue if only for the essay by Orlando Reade (great name), ‘Notes on an Unfamiliar Poetry’, which explores Richard Parker’s Crater Press, and two of its publications: The Stats on Infinity by Keston Sutherland and For the Administration (After Rimbaud) by Sean Bonney. It’s dense but very readable and says some enlightening things about individual poems, techniques and ideas. Which is refreshing. Some of the criticism coming out of the poetic avant-garde says nothing at all, but is wrapped up in its own jargon, paranoia and self-regard. Crater is a letterpress operation, each book painstakingly handcrafted. I share Reade’s question about the ’boutique’ production of politically radical literature. He asks: ‘how does the boutique form of these pamphlets not undermine their political thinking?’ His answer, via Parker, that each book, with its ‘fresh errors’ and ‘human mistakes’, becomes a ‘performance of a rare authenticity’ I find insufficient. Claims to authenticity are always suspect in my mind. Of course, if radical poetics aspires to a critique of capitalism, then one can understand why releasing hand-made pamphlets in small print-runs to a limited circle of readers is favourable. But is it not also plausible that this tendency towards the hand-bound and letterpressed, the limited run, the poorly publicised, and the widely unavailable, is really just the result of a lack in demand that has become institutionalised and fetishised as a political position within the small world of avant-garde poetry? I’ve not received many press releases from avant-garde poetry publishers. There seems to be only limited and sporadic ambition for significant sales or exposure. I suspect some believe this would risk bringing the “authentic” into the compromised sphere of the “mainstream”. Perhaps, for better or worse, this is what happened at Salt, a press which introduced me to dozens of important avant-garde poets (including Bonney) but which has now moved in a different direction. It is the ‘limited edition’ status that I have reservations about. ‘Limited’ may be stretching it. At 1000 copies I suspect the publishers may have put the bar down just this side of demand. A good publisher (and I’m not claiming I am one!) creates demand by taking risks – and also, by getting their hands dirty with the business of selling. Anyway, I digress. There is also a short poem of mine in here. It’s called ‘Everyman’ and was written in response to the English Defence League’s ‘static march‘ in the City of London last year (they wanted to march into the East End … memories of blackshirts in the 30s…) but were kettled, so to speak, just inside the City at Aldgate. You can find out more about The White Review at their website. Oh, and Crater Press are over here. Must get myself a White Review. What’s up with the Penned website Tom? Can’t get it to come up. Wanted to check out Adventures in Form. Is it out? Hey Oliver there shouldn’t be a problem with the Penned website … what browser r u using? Google / Blogspot – it’s still coming up blank today. Is it just me? I know I’m going off at a tangent to your posting here, but I’ve a feeling that the output of the very tiny presses might form quite a high proportion of the poetry books from our time which actually physically survive into the future. There’s the obvious issue of Print-on-Demand books that only ever get demanded in tiny numbers, but with larger publishers who have to pay for storage and distribution, books tend to come with a sell-by date. I’m thinking of the case of a poet friend who had a book published by a well-known and well-distributed UK press: the book didn’t sell well, and after a few years he was offered the chance to buy a hundred copies at a discount, while the rest of the edition was pulped. That’s going to be a rare book in future, with far fewer copies surviving than its notional print run. I think that kind of situation pretty much never arises with the very small presses — nobody ever throws out the box of books under the bed, so it may well be that a short-run pamphlet will end up surviving in greater numbers than a paperback you can buy in Waterstones. Thanks for your kind words on my ‘Notes’. Of course, rereading the thing in print, I noticed the grammatical dead-ends, repetitions, and incoherences – you are to be congratulated for reading the whole thing! Readability is important, but I must confess I haven’t read an essay by an member of the ‘avant-garde’ which suffers from self-regard or paranoia, and even this community’s most forbidding ironies, questing through the manifestations of jargon capitalism, are often highly readable. Though I remain unsure how a question may be shared, without being partitioned off, I have a few thoughts to offer in response to your post above. First, I’m glad you disagreed with the suggestion that the Crater Press book represents a ‘performance of rare authenticity’. It was insufficient: a moment of breathlessness I should have extended into a more rigorous formulation, and symptomatic of a more general triteness I wouldn’t have allowed myself if this hadn’t been an consciously awkward attempt at writing literary journalism about a kind of poetry which abhors the practice. Rare suggests rarified; I meant unique. You’re right to be suspicious about personal claims to authenticity, which should not be considered a path but the horizon for ethical action. In any case, your mind shouldn’t suspect authenticity so quickly that it seems totally impossible. Richard Parker would never claim authenticity in doing all this – he just taught himself to make books – but the attempt to recapture agency from the morass of equivalents which otherwise lead ethical thinking to the abyss is the ‘whole thing itself’. Crater Press represents a personal attempt to control the production of books – the sourcing of materials, transport, dissemination – and limit the harm caused by this product, to be more fully the ethical bearer of this harm. In this I’m thinking of J.H. Prynne’s lines: ‘causing the forest/ to fail softly by watching leaves turn’. Printing poetry must seem the most perverse decision in the whole retarded business when you think of the environment. But then again, reading a text from a screen extracted out of some distant exploitation – minerals from the Congo, for example, or workers in Shenzen – simply gives a different texture to our complicities. Not reading at all is out of the question, isn’t it? Crater books are as scrupulous an attempt to make poetry available to a readership, while limiting the potential harms, as any other print market negotiation. Secondly, the notion of the boutique was a red herring. Crater – insofar as it doesn’t impose artificially high prices on its products, doesn’t locate itself in relation to anything more institutional or prestigious than poetry itself – is not itself a boutique, nor are their books boutique. The prices reflect the cost of production, though they don’t take into account the largest (uncalculated) cost: the value of Richard Parker’s labour. In this respect, Crater Press is truly uneconomical. If you were to explore the community beyond their more prominent achievers on the Salt roster, you could quickly discover that this nebulous community of readers and writers is not inaccessible to outsiders, and does not insist on restricting the dissemination of texts to high quality paper. Your suggestion that these books represent uninterrogated fetish objects is unfair. I don’t know if you are familiar with Prynne’s Not You (collected in the Bloodaxe Poems) or John Wilkinson’s Proud Flesh (reissued by Salt), but these poems make serious, committed interventions in the domain of the ‘not-me’ possession, which D.W. Winnicott described in his work on the transitional object. Denise Riley’s poetry and Andrea Brady’s criticism also make notably conscientious excursions into this psychological no man’s land. Such attention is, as far as I know, unmatched in any contemporary writing (psychoanalytic thought included). While you try to ‘create demand’ through market strategies, these transitional objects give, through presence – there – consolation, the warmth of a person found in the world. In fact, to resurrect the necessarily ambivalent notion of a ‘performance of authenticity’ which involves the whole body, Crater Press books constitute the precise opposite of fetishism. This is not desire displaced onto inanimate objects. Richard Parker’s hands are not the purchase for a libidinous reader. To print on a letterpress involves at least one whole body, which is required to move between trays to set the thing, then a certain amount of upper body strength and control is used literally to press the words onto the page. As a means of production, this is potentially far less alienating than print-on-demand, where disembodied eyes and hands fling the document off to a machine in another place where it is made available to the world by someone or something that doesn’t even need to read it, let alone care about what it says. As you notice, the Crater books are limited editions. The print run does vary according to an estimate as to how many will be sold. To do otherwise would create waste or inconvenience. But surely you can recognise that all books are effectively the same? Print-on-demand are unlimited, but only theoretically so. No one would be so unwise as to forget that unspoken limits dictate the book’s design, price etc. Crater Press doesn’t indulge in the kinds of risk which aim for the expansion of profit margins, make economies of ever larger scales, colonising new markets of readers. The risk involved is that this project is not subsidised by an institution, personal wealth, by donations (like the White Review), but through ongoing rhythms of cost and revenue, and could fail through bad economies at any point. The books made are not marketed or publicised, and I’m surprised that your researches into Barry MacSweeney didn’t impress upon you the perilous relation between poetry and PR. If these poets are cautious in their engagements with organs which, subject to the vagaries of free market economics, aim at a ‘popular’ audience (if such a thing exists for poetry, in this country, at this time) it doesn’t stem from a puritanical contempt for ‘the people’. To invert the grotesque parallel made in my article, Van Gogh didn’t write letters to his brother so that they could be exhibited in a Royal Academy blockbuster. After several years of engagement with contemporary poetry, I am still unclear what ‘mainstream’ means. I assume it means to enter into the competitive spirit of narrow-minded poetry prizes, or publishers who would only risk printing ‘innovative’ poetry once it has been long sustained by this ‘exclusive’ community. The same is now true of Salt. I spent this morning reading Luke Kennard’s The Harbour Beyond the Movie, which they published a couple of years ago, and those poems are so shrink-wrapped in their cool ambivalence that they seem to have no breath at all. Back to the nostalgia machine, the White Review, and its efficiencies. As you point out, ‘[t]he whole thing is quite sumptuous’. Of course, having tried to propose an anxiety around the printing of radical texts in boutique books, I found that the journal nestled in my hands, while the inserted folded pages fell out, as if through an excess of generosity. As soon as it arrived, I realised that the anxiety I had tried to describe around the relation between the politics of a text and the aesthetics of its production were multiplied in that luxurious item. Though some of the texts they publish strike me as valuable, the ‘whole thing’ makes me feel uncomfortable. But isn’t the typeface perfect? Precision is important, of course, and elegance not always fatuous, but surely the ‘ authoritative’ is something we should handle with great suspicion. The inheritors of the Bloomsbury set have policed the distribution of real and symbolic capital in English poetry for far too long, and imitations of their aesthetic by a younger generation, especially under the banner of ‘progress’, is a future made in the degraded image of the past, the death mask mistaken in the candlelight for the body itself. Futures aren’t forged, they’re sold on the markets. The question of sufficiency returns to haunt us. The problem with sumptuousness is what you’ve got to be careful what you ingest. The White Review might one day imitate its illustrious predecessor, if they can be brave enough to publish poetry whose authors keep authenticity in view, and make work which disdains the authority of prestige and paranoia of institutions, but does not abandon its interest in communities. The question here is the ‘whole thing’ – that extension of our selves into the partly unfamiliar realm of the not-me, from the blanket to the shrink-wrapped – the concern over limiting harm played off against the impulse to inflate the world with gasps of desire or, even worse, good intentions. What I’m especially interested to know is this: to what (or whose) size is the world sufficient? Thank you for your very substantial comment, which is really intriguing, and generous of you to write. I should, for the record, say that my more, shall we say, provocative comments in the blog were not directed at Crater. And I have contacted Richard to clarify that, in case he took offence (which was/is absolutely not my intention, as I admire what he is doing). I would like to reply to your comment in full, but I feel rather inadequate to do so, but if I get the time in the next week I’ll try. Whilst digital printing with its shorter runs has liberated people like me who would otherwise have no way of affording traditional printing, pure POD removes financial risk from the publishing process, and therefore the publisher’s incentive to market the book as widely as possible. Many a tome has slipped into this gaping hole! !